SXPA brings back the joy of experience gain through completing tasks as per older TES games, whilst integrating seamlessly into Skyrim and preserving the delicate balance. Spending XP rework + configuration values now shown in configuration menus! - Added multiplier configuration options for all existing XP activities. - Added the 4 remaining crime activities as well as configuration options. - Configurator now shows default/current activity state and multiplier values. - The configurator is now a lesser power spell by default instead of a book. - Added an option to switch between configurator types. - Added mod compatibility as a configurator option to enable as needed. - Added support for SkyrimSouls - Unpaused Game Menus (SKSE Plugin). - Spending XP on a skill now properly levels up that skill for all levels earned. - Added the option to spend a percentage of your XP on levelling a skill. - Added an exit button [X] to all configuration menus to make exiting easier. Major update + huge improvements + fine-tuned XP balancing! * Locations Discovered: 0.6, down from 1.2. * Standing Stones Found: 5, down from 6. * Nirnroots Found: 0.4, down from 0.8. * Ingredients Harvested: 0.15, down from 0.2. * Wings Plucked: 0.4, up from 0.3. * Persuasions: 0.8, down from 1.5. * Intimidations: 0.8, down from 1.5. - Switched from Global Variables to an Integer Array for tracked stat counts. - Adjusted functions that hand out XP to take into account XP activity states. - Added a notification when enabling XP activities with counts > 10. - Added a function to display an estimated time to complete a task. - Re-wrote the function that detects existing XP activities. - Re-written function now accurately handles XP distribution across levels. - Added a check to disable active monitoring whilst enabling XP activities. - When an XP activity is enabled it'll run the function for existing XP activities. - Hid notification messages for existing XP activities found to reduce UI spam. - Added a notification to show total XP gained across total XP activity events. - All mod logging has been disabled by default (linked to debug variable). - A notification will now appear if you are playing in debug mode. - Added the option to reset and recalculate XP for all supported XP activities. - Added the option to reset all SXPA values to their original default values. - Added an option to manually run a stats update for XP allocation. - Added a request to wipe SXPA user data as part of this balancing update. Tons of fixes, improvements, and a teaser for some new XP activities! - Added a fix for the detection of existing XP activities to actually trigger. - Added a fix to disable XP activity active tracking whilst updates run. - Added a fix to run update functions after SXPA patches/updates. - Added a function to handle backing up all user data before updating. - Added functions to easily wipe stats/arrays if an update/patch requires it. - Added a ton more debug messages for all the new functions. - Fixed a bug that allowed vanilla skill multipliers to affect SXPA skill levelling. - Reworked the existing XP activity gain formula to balance out high levels. - Custom settings you select via configuration now persist through updates. - Reset the XP spent variable due to inaccurate calculations being used. - Corrected the XP spent variable to track total generic XP spent instead. - Added a variable to track effective (generic -> specific) XP spent. Much rejoicing is to be had as rogue formula is annihilated! - Corrected an error in a formula calculation that led to inflated XP numbers. - Added support for balancing existing XP activities. - XP values from v1.0.0 will be reset and re-calculated to balance properly. - Added all 18 Skills to spend XP on from within the configurator. - Skills are now grouped by 3 distinct categories; Combat, Magic, Stealth. - Added better debugging support to help find potential issues quicker. - Balanced XP gain/spend ratio so it is easier to gain, harder to spend. - XP values for all 18 skills are now separately stored in arrays for stability. - Spent XP is now also tracked in its own array to ensure maximum stability. - Quite a few overall improvements to speed, especially with the configurator. Today (as of the publication of this mod; 11/11/17) marks the 6th year anniversary of Skyrim, and as such I saw it only fitting that I release this mod, after weeks of coding and testing. A tribute, to an exceptional RPG. Long live Skyrim! Hello, traveller! It is great to have you here! Wondering what exactly Skyrim XP Addon is? Let's take a look! 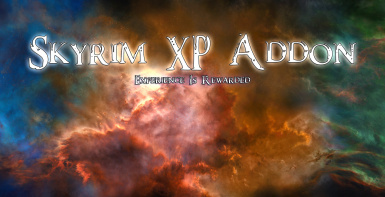 Skyrim XP Addon (SXPA for short) was born from the idea of rewarding players for various activities that can be performed throughout the game, as well as mod-added activities with mod support on its way. Skyrim XP Addon actively (in a lightweight manner, which is configurable) tracks a list of XP activities and when it detects that you have completed an activity will reward you with SXPA exclusive generic XP which can be used towards levelling up any of the 18 vanilla Skyrim skills. One key feature that always drew me into RPGs was being awarded an arbitrary experience value for completing a task, something that I guess I have grown quite fond of considering here we are today! So when it comes to Skyrim, one is not rewarded experience for the amount of locations they have found (another ESO plug, anyone?! ), Nirnroots they have carefully plucked, books they have meticulously read or even the amount of chests they have plundered, among various other activities! Outrageous, I tell you! Now I am aware that other such mods exist, but they tend to completely overall the way one gains experience in Skyrim as a whole. If that's what you're into, then, by all means, do check out those wonderful mods! As for SXPA, the goal is to integrate within Skyrim and preserve the levelling balance, whilst offering each addition as optional and completely customisable, by you, the player. Furthermore, the beauty in the way this was dynamically coded is that you do NOT require a new game for the mod to work correctly, as SXPA will automatically detect all prior supported experience activities and award you the relevant XP! It also has no required dependencies such as SKSE, for you purists out there! Please see the Frequently Asked Questions and List Of XP Activities Tracked sticky in the comments section for additional information. None for now, except the base game; Skyrim, of course. I thoroughly recommend using Mod Organizer to help installing mods and managing your load order. For NMM users, simply hit the "Download With Manager" button and enable the mod once the download completes. Step 1) Download the latest version of Skyrim XP Addon and extract the archive contents somewhere. Copy the contents of the Data folder into the Data folder in your root directory of Skyrim, overwriting any files if asked. Ensure you don't place the Data folder inside the Data folder of your Skyrim directory. Step 2) Ensure my plugin is loaded in your mod manager of choice for my changes to take affect. If changes are still not taking affect, either the mod was installed incorrectly, or there is another mod that is overwriting the changes. Please let me know either way and I will do my best to try and help you out. MO users simply install the archive as a new mod as per normal and enable the mod, ensuring no other mods are overwriting any of my files. Please do not extract the contents of the BSA file. To uninstall this mod, browse to your Data folder in your Skyrim root directory and remove Skyrim XP Addon.bsa, Skyrim XP Addon.esp as well as Skyrim XP Addon.bsl if you copied that across for some reason. MO/NMM users simply disable and/or remove the mod as per normal. If you extracted the BSA file, as asked not to, best of luck in cleaning up your Skyrim install and not breaking any other mods in the process. This mod is completely isolated and runs a custom set of scripts to achieve its purpose, thus incompatibility is highly unlikely. If you find a mod that somehow clashes with my mod and is overriding changes; please let me know and I can make a patch as necessary. Marwolaeth - for their tireless support and assistance in some of the more insane mathematical calculation functions. AkromaAngelOfWrath - for waiting hours on end whilst I was resolving the v1.0.0 blunder when we were supposed to be playing Guild Wars 2! InsaneMatt - for putting up with (no doubt) infuriating questions on a programming language they despise; yet being super helpful and offering solutions. Bethesda Softworks - for making several engaging and captivating RPG's to date and bringing players closer as a community through modding! Nexus Mods - of which this community wouldn't exist so well organized and staffed not to mention the plethora of mods hosted! You - for taking the time to read through this and/or trying out my mod and that of others thus ensuring the community lives on! Additional credit and acknowledgement goes out to any and all persons who made the above possible, who without, this mod would not be possible. I am relying on those I have credited to have done the same (on their own respective mod pages or elsewhere) but mistakes and oversights do, unfortunately, happen. So to all you lovely people above, and to anyone I may have missed and not mentioned, THANK YOU! Your work is deeply appreciated and I hope that in releasing this mod, to work alongside other great mods, I am doing you proud and allowing your work to live on and to withstand the test of time that is this modding community! It has been an absolute pleasure being a part of such a wonderful community!